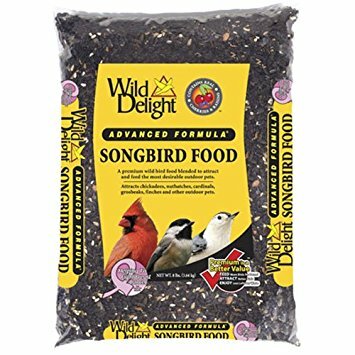 Songbird Food is a premium wild bird food blended to attract and feed the most desirable outdoor pets. Grosbeaks, Finches, Cardinals, Doves, Nuthatches, Thrushes, Songbirds and other outdoor pets. Note: Seed ports must be large enough to accommodate large fruit and nut pieces. Feed desired amount in a tube feeder with large holes, hopper feeder, platform feeder or on the ground. Keep feeders full. Clean feeders frequently. Keep clean, fresh water available. Feed all year long. Sunflower Seed, Safflower Seed, Sunflower Kernels, Peanuts, Dried Cherries, Dried Raisins, Vitamin A Supplement, Vitamin D-3 Supplement, Vitamin E Supplement, Menadione Sodium Bisulfite Complex, Thiamine Mononitrate, Riboflavin, Niacin, Choline Chloride, Vitamin B12 Supplement, Pyridoxine Hydrochloride, Biotin, Folic Acid, Ascorbic Acid (Vitamin C), L-Lysine Monohydrochloride, DL-Methionine, Potassium Chloride, Sodium Bicarbonate, Manganous Oxide, Ferrous Sulfate, Copper Oxide, Calcium Iodate, Zinc Oxide, Magnesium Oxide, Dextrose, Artificial Flavor.